With Christmas coming up, I expect many people are struggling with ideas for presents for canal enthusiasts and narrowboat owners - particularly the latter as space is limited. So taking an oppurtunity to plug my shop. here are a few ideas! Firstly, a set of gifts with traditional narrowboat roses. I made these digitally but using the traditional method of a centre circle overlaid with lines and petals that are slightly transparent so the background shows through, as you can see in the close-up on the left. Although shown with a blue background, that can be changed to any colour using the customize button. These are on all sorts of products from stickers and keyrings, to cushions and bags, iphone and ipad cases, and of course mugs and coasters. 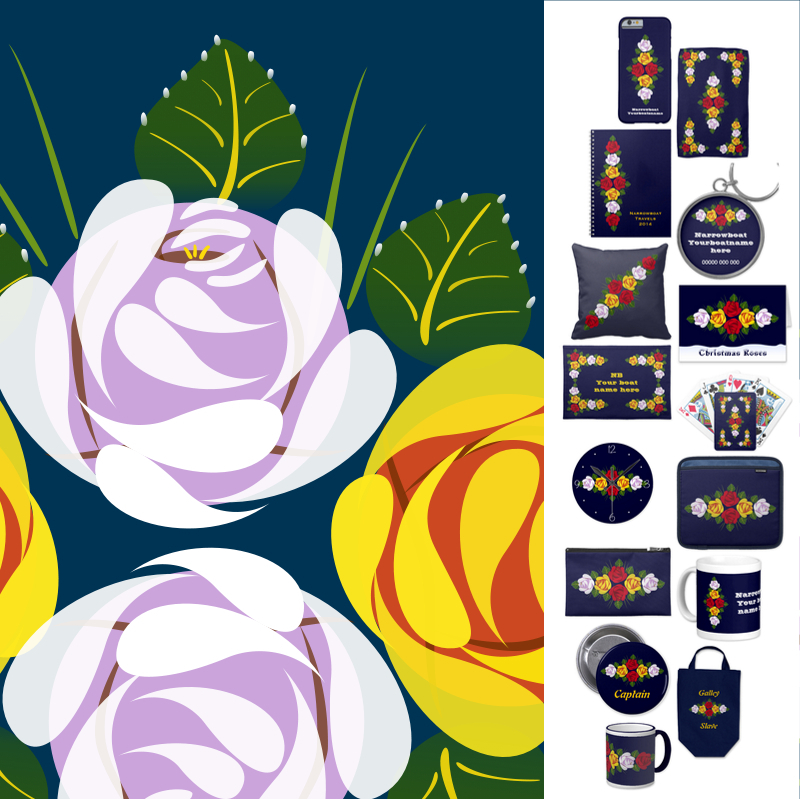 There are too many to list here but the whole range can be found in my Zazzle shops: Puddled Clay (UK) in the UK, or in America, my Puddled Clay (US). Please note that these links also contain my referral and tracking codes. There are also other international domains and most products are shipped internationally. I ordered a clock, calendars and some greeting cards recently, and they took about two to three weeks to arrive as they come from America, though the clock came very quickly, and I'm very pleased with all of them! For other ideas for presents, my shop also contains some digital paintings, vintage photos from English canals, as well as some of my old photos from canal trips since the 70s plus newer ones of French canals. I do hope you'll come and visit, even just to browse! Lovely to see your Canal images, though my one family canal holiday (on the Burgundy Canal) was an unmitigated disaster! But I love the long boats and the way they're decorated so I particularly like your 'Rose' designs in your Zazzle Puddled Clay store! Are you thinking of doing more? That style is very popular here in the UK.